Red color in a gerbil's eye and tears often looks like the rodent is crying blood. While in most cases, that isn't true, it's distressing to see unless you are informed regarding the biological reasons for the color. It's red eye, caused by porphyrin. There is no reason to be alarmed, but there is cause to follow up with veterinary care. Porphyrin is secreted by a horseshoe-shaped gland called the Harderian gland that is located directly behind the gerbil's eyeball. Prophyrin is an binding compound in blood cells. It works to connect metals such as iron and magnesium which help form blood platelets. In its pure form, it is a deep purple color. When it is released into the body and mixes with other body fluids, it turns a reddish brown color similar to blood. When gerbils are under stress, this otherwise natural release of porphyrin supporting blood functions actually becomes an irritant. Veterinary researchers do not fully understand the biological reasons for this. Yet the release of the porphyrin into the bloodstream when experiencing other stress factors can cause an overwhelming itchy sensation. The most obvious symptom of red eye is the red coloration in the eye and in drainage seeping from the eye. Skin irritation and constant scratching resulting in hair loss are also symptoms. The area near the eye can become red and inflamed. Scabs or sores may form on the face. When scratching continues, these sores are prone to secondary infections. Poor nutrition is a leading cause triggering the itchy sensation associated with the release of porphyrin. Other environmental factors are stress-causing culprits. Gerbils that are too hot or too cold will become stressed. Too much or too little light causes the same reaction. Gerbils don't like high humidity; when their living environment registers more than 50 percent humidity, it becomes a stress factor. Overcrowding or an inability to get along with cage mates can also cause stress leading to red eye and itchiness. While it may seem visually obvious that your gerbil is suffering from red eye, a veterinarian still should do a thorough exam just to rule out any other underlying causes. 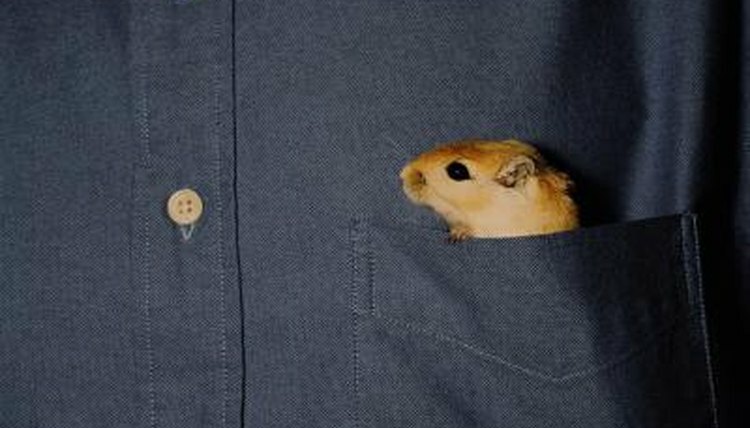 A good rodent veterinarian will ask for a complete health history, including information regarding where you obtained the gerbil. If sores created from scratching have a secondary infection, the veterinarian will take tissue samples to identify bacterial causes for treatment purposes. Most veterinarians use topical medications to clean the eye and surrounding infected areas. Secondary infections most likely require antibiotics for full treatment. While it is difficult to control all factors that might be stressful to a gerbil, a few passive efforts will help reduce another occurrence: Keep humidity levels below 50 percent, maintain population limits within the living environment, and feed a highly nutritious food. As with humans, dust or other foreign debris lodged in a gerbil's eye causes the surrounding tissues to react in a protective manner. This often leads to redness. If the irritant is minor, a pinkish color may appear instead. The dust frequently associated with bedding in gerbil enclosures sometimes gets lodged in the eye, causing a pink or reddish tinge as the eye tissue secretes a protective coating.